Paul Bracher, author of the ChemBark blog spent part of his post yesterday responding to my post from Wednesday, Fraud in the Literature, Blogs and Witchhunts. He had to use some slight-of-hand in order to somehow relate my broad, nonspecific post to his (ChemBark's) recent postings on fraud. Specifically, Paul stated "User “juicebokz” on Reddit called John’s post “a letter to ChemBark”, and I feel compelled to weigh in..." And so that comment by a third party opens me up to a direct response from Paul, even though I think it would be more properly directed to "juicebokz". To be fair, Paul's comments were fairly general and could be part of a response to anyone criticizing his efforts, so I'm not going to respond to them directly, and I would have to little say against them as well. Instead, I'm going to try and clarify my thoughts from earlier in the week. My post Wednesday was never directed at any individual in particular - especially individual bloggers - but to the commenters that pile on afterwards. As I said then, "Many of the commentators screaming for blood are young professionals you have yet to run a large, established research group, but who think that they will be able to do so flawlessly in the future." It's no secret that most of the commenters on blogs and reddit are "young", is it? And yet this group of people is creating a very viscious environment which in 20 years or so they will inherit. Is this really what they want? Have they thought out all the consequences? It's a lot of fun now, but when the shoe is on the other foot (and it will be at some point), will you wish otherwise? Is it so bad of me to offer advice against creating this sort of environment, or to at least proceed with some caution? It's the mob mentality, the anonymous individuals posting on blogs, Reddit and elsewhere (I presume - don't ask me - I'm no social media guru) that I am frightened of and that represents the worst of human behavior. Any single blogger is not a mob (not even a group blog like The Chemistry Blog). As it was on Wednesday, I have no intention of speaking evil of Paul (he has recently written kindly of me). I've never met him, but I certainly would like to some day. His research seems pretty fascinating (the Chemistry of Prebiotic Earth) and I wish him all the best as he starts his very challenging career. If anyone in the mob is looking for a blowout, knockdown fight, Jerry Springer-style with chairs over the head, they'll have to go elsewhere. Paul closed with a thoughtful question: "At the end of the day, I would love not to have to write about scientific misconduct because (i) chemists have stopped doing it or (ii) universities, journals, and government have created a good system for dealing with it. Now, how do we make that happen?" Data fraud is unacceptable and few would feel that we shouldn't fight against it. Paul (and other bloggers like him) are trying one approach. An unintended consequence of this approach - at this point in time - is that the original blog post can become a rallying point that brings out the worst in group behavior. Do we want that? Can we prevent it? Is it an acceptable price to pay? Is there a better approach to try? I don't have answers to these questions (including Paul's), but we (chemists, one and all) need to discuss them and decide. It's our future, (more yours than mine), and we can have a strong influence over it. Let's make sure that it is the future we want. To discourage careful, thoughtful blogging would be a shame. The comments section on almost ANYTHING on the internet is riddled with poor online behavior. Should a blogger not blog because of what will develop in the comments section? I am a fan of how blogs allow thoughtful debate, and as with your post, there's was no personal attack intended by mine. As a rhetorical device, I think it is useful to argue (as in, advance a point---not fight) by being direct. I was happy to use your post as an opportunity to address some issues that have cropped up w/r/t the treatment of misconduct by bloggers. I always appreciate when people sign a name to their ideas, and these posts/comments also tend to be more thoughtful than is typical. That was the case with your post, so I used it as a springboard. I share your distaste for some of the comments left on blogs, but I have greater distaste for censorship. It's a tough call, and I've tried to explain my thinking on the blog for where to draw the line, but there are always going to be problems. I am resolved to muddle through with the belief that blogs (and blog comments) are, as a whole, quite valuable. 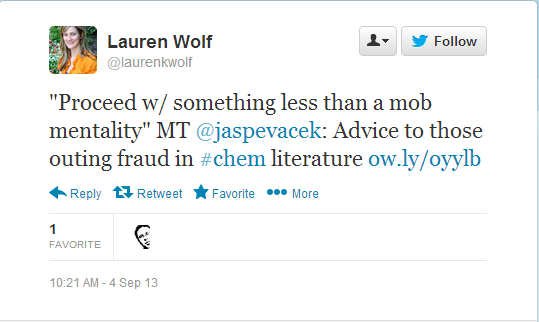 Finally, I love your blog and the expertise you bring to the online chemistry community. I know practically nothing about polymers, and I am very glad to learn about them and be called out when I say something stupid (like natural rubber "drying out")! I also enjoy when people voice dissent (about anything), because it tends to lead to more thorough analysis.